This warm salad can stand alone as a light meal as well as being an elegant 1st course. The heat of the chili makes it a perfect partner to a fruity reisling. Add 2 tsp peanut oil to medium sauté pan and heat pan to high, but not smoking. Sear scallops 1 minute per side. Put next 6 ingredients in a bowl. Wisk to blend. Divide radicchio and arugula between 4 plates, top with 2 scallops each. Drizzle with dressing. Garnish with scallions, cilantro and chopped peanuts. 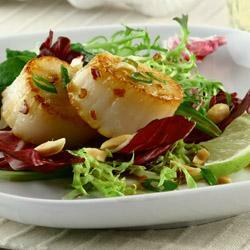 Warm Salad Option: The dressing for this salad can also be heated with the scallops and served warm. The dressing also makes a nice marinade for chicken or fish as a substitute.